I love anthologies. You can browse in them, pick out the poems you love, follow up the poets you haven’t heard of and, if it’s a themed anthology like this one, marvel at how the same subject can be treated from several angles. The excellent Emma Press has collaborated with the Centre for Travel Writing Studies at Nottingham Trent University to produce this short collection, most of whose contributors are unknown to me. How much more interesting to be a passenger contemplating the desert and stars. Another excellent poem, ‘Aboard the Grey Ghost’ by Simon Williams, is written in the voice of a child evacuee crossing the Atlantic and knowing that there are U-boats on the prowl. It ends ambiguously and it resonates in our own century when so many people are entrusting their lives to fragile boats. when you pull him home. The subjects are highly variable. There is Valentina Tereshkova, the first woman astronaut; there are European settlers naming various parts of New Zealand (which probably have names already, as a matter of fact). Zayneb Allak visits her family in Baghdad between wars and, unlike them, can go back to a place of safety. Nick Littler in ‘The Girls from Maynard’s’, describes a group of randy teenage boys hoping to get off with some girls, who are then shocked to find that one of the girls is ‘alone in bits’, killed by a train. 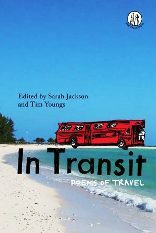 This is a fine little book which may well inspire you to write your own poems about travelling. London Grip Poetry Review – Jessica Mookherjee	Peer Gynt, Henrik Ibsen, Arcola Theatre. Review by Barbara Lewis.